Idelle Weber is an American artist most closely aligned with the Pop art and Photorealist movements, although her work was always a challenge to categorize. 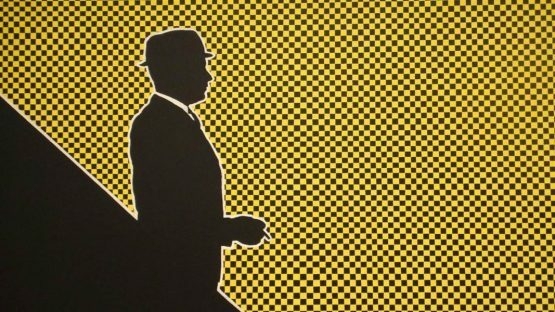 She is best known for her silhouette paintings resembling the visual language of advertisements, a reason why Weber was so often linked to Pop art. Her work captures outlines of figures such as businessmen, secretaries and travelers engaged in ordinary, everyday activities and placed against colorful flat or patterned backgrounds that often resembled the style of Pointillism. Later in her life, Weber shifted towards photorealistic landscapes and outdoor still lifes of trash, carts, rocks and other urban debris. 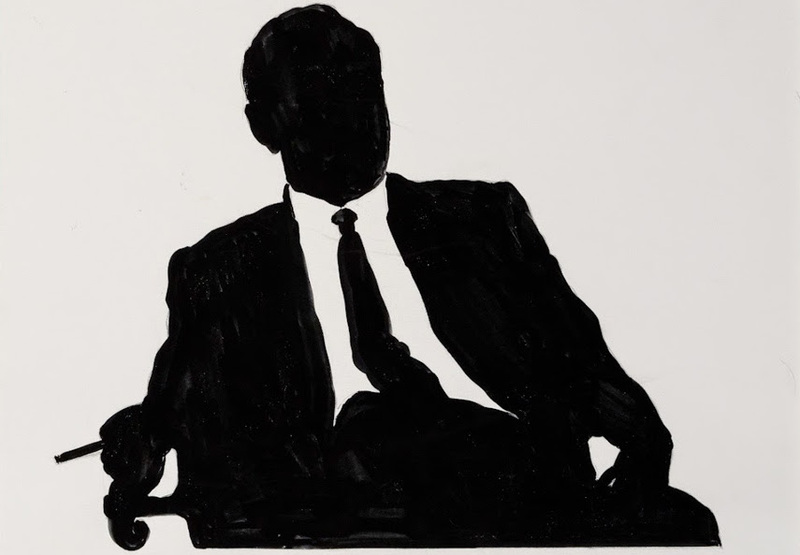 During the second half of the 1950s, Weber created the first of the silhouette paintings that would soon become central to her work of the next decade. She studied at the Art Students League and it was here that Idelle initially started to develop her unique style. 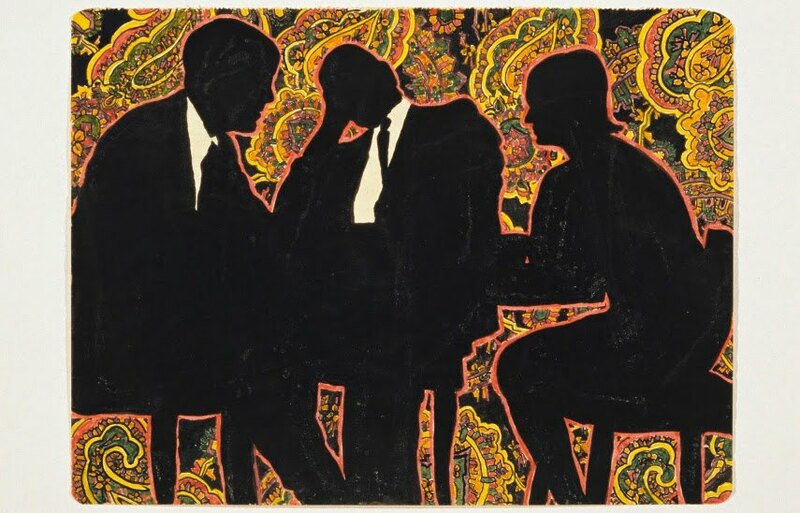 By the early 1960s, she was heavily involved with New York’s progressive art world and established herself as one of the leading artists who were ready to experiment and push the conventional frontiers of the art scene. During this time, she was represented by Bertha Schaefer. Soon, Weber began creating hard-edged silhouettes of people placed over backgrounds that were planes of color or, more frequently, patterned with flat grids, dots or other designs. These silhouettes depicted businessmen, office workers, couples, brides, families in quotidian activities, etc. The archetypal quality of the forms in Idelle Weber’s compositions suggests standardization and commercialization, as well as an implication underscored by the crisp outlines and broad forms that resemble advertisements. This is the main reason why the artist was so frequently linked with Pop art – whether critique or celebration of American culture, her works offer a graphic appeal that reflects her Pop milieu. By the early 1960s, her work was exhibited widely at venues all over the world. About a decade later, Weber shifted her focus to representational paintings of New York City fruit stands and litter, finding inspiration in rubbish. This was the last big phase of her career as no other radical change appeared in her work ever since. By using silhouettes, Weber renders the figures in her compositions anonymous, making them archetypes of the capitalist system and suggesting standardization and a certain lack of individuality. This is the way most art historians tend to interpret Weber’s body of work despite the fact such deeper meaning may cause a gap to appear between this artist and the Pop movement which obviously had different creative agendas in mind. Nevertheless, the Pop art world embraced Idelle Weber due to her originality and talent, so both her name and work are now regularly found alongside the most representative names and pieces in the movement’s arsenal. Idelle Weber lives and works in New York City, United States.